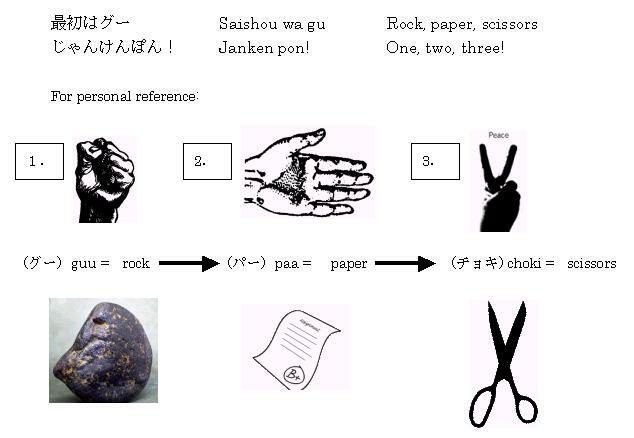 Teaching Janken in elementary school makes for a good lesson, but I that the Japanese version sounds so much better than “Ro sham bo” or “Rock, paper, scissors…”. Watching it played in Japan can be really entertaining because it sometimes takes on tones similar to those of a Wild West showdown or the fierce swashbuckling of pirate-folk. Especially when the stakes are high. Janken settles everything neatly and quickly, with authority. Who gets to ride shotgun? Who has to pay for the next round of drinks? Who gets the priviledge of sitting next to the English teacher during lunch? Should we go soak in an onsen or grab some food and beverages? Who has to eat the big chunk of wasabi as punishment for losing? Any decision made by Janken is solid as stone. And unlike an arbitrated decision or ther verdict delivered by a court, it is very rare to see the loser really complain about the fairness of the decision, let alone contesting it. This simple game has a very colorful anthropological and linguistic history behind it, spanning over years long gone, and weaving itself into the fabric of cultures around the world. It is interesting to note that the symbols used vary widely from place to place, and within the same region depending upon the social context. In Japan there are several versions including a variant of Janken played with the face (a good old fashioned drinking game), and one specific to Osaka. Janken should be used more often to mitigate problems and disagreements between individuals and groups of people. With the responsible usage of Janken, imagine how much faster problem mitigation would become should our world leaders, political groups, and more adults in general used it to settle our differences. It certainly works in the context of public schools and between friends and peers. But you’ll always find someone who, once they lose, demands that Janken is always played two out of three. This is almost always the person who will change the rules to back when they win the first round. Unless otherwise stipulated, one round of Janken determines who wins and who loses. Period. How can I best describe this product… um… moist hole in a can. They didn’t have an opened one, so I really don’t know what this can contains exactly. Is it edible, and if so, what flavour is it? Does it have a heating catalyst or do you have to heat it up some other way? These and other questions need to be addressed. Take any 3 digit number, and make it’s palindrome (by reading it backwards), and add them both together. Take the sum of the 3 digit number and its palindrome and repeat the process. Yes, it’s another day in the office working on the dreaded Ashiya curriculum, which means that my brain needs to be exercised lest it die from atrophy. A co-worker brought in some slime and started to play with it, which got me thinking about colloids, gels, polymers, and the properties of substances that exhibit behavioral characteristics of both solids and liquids. Rheopectic – Rheopecty is the property of some non-newtonian fluids to show a time dependant change in viscosity; the longer the fluid undergoes shear, the higher its viscosity. Rheopectic fluids are a rare type of fluids, in which shaking for a time causes solidification. A common house-hold example is corn flour (also known as corn starch) mixed with water. Thixotropic -Thixotropy is the property of some non-newtonian pseudoplastic fluids to show a time-dependent change in viscosity; the longer the fluid undergoes shear, the lower its viscosity. However, this is not a universal definition; the term is sometimes applied to pseudoplastic fluids without a viscosity/time component. Many gels and colloids are thixotropic materials, exhibiting a stable form at rest but becoming fluid when agitated. Some clays are also thixotropic, with their behavior of great importance to structural engineering in earthquake zones. Clayey ground can practically liquefy under the shaking of a tremor, greatly increasing the effect on buildings. The classic example of a thixotropic fluid is ketchup, where waiting for it to pour can be more effective than pounding on the bottom of the bottle. Thixotropic compounds are important paint additives, allowing a thick, smooth application that doesn’t run. Sometimes it’s fun to learn words that, if used out in public, will brand you as a pretentious geek. If you do use them out of their limited context with any seriousness, then you are probably a tool. 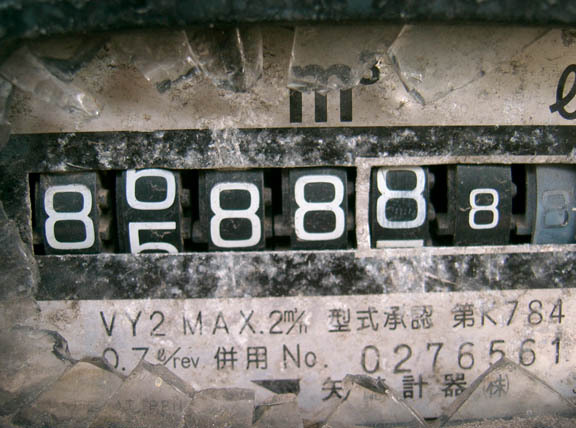 This meter is my good luck charm, located some place that no one will ever discover, frozen for the rest of time showing almost all eights. This is an actual toy set that is currently for sale at Toys R Us in Japan. Can you picture some little kid asking for this? 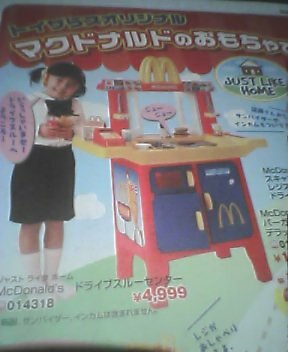 Mommy, when I grow up I want to work at McDonalds! All jokes aside, working at Mickey D’s doesn’t have the same stigma attached to it over here as id does back home. The workers do their jobs with pride and efficiency, and the clerks that I have talked genuinely seem to like their jobs. Another indicator that things are way different over here: I haven’t even heard any stories about disgruntled employees spitting in (or mixing various bodily fluids in) the food or beverages. So maybe Japanese McDonalds is better than the McDonalds in the States after all. Today, when I was teaching “Let It Be” to my high schoolers, I asked a teacher to translate the phrase “let it be” into Japanese. He then said the phrase in katakana English and waited for me to proceed with the lesson. I looked at him in bewilderment and said “No, in Japanese please”, to which he replied “hakuna matata!”. I lost the struggle to maintain composure, unsuccessfully trying to contain frustruated laughter as I asked him again. 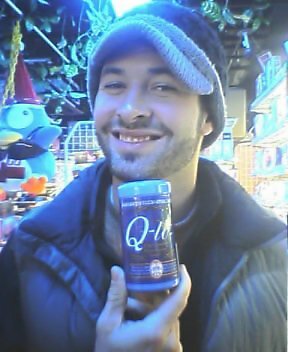 He answered “se la vie”. Smack! Not that I was being melodramatic, it was a parasympathetic response that caused my hand to slap my forehead with such force. And that’s pretty much how that lesson went for that particular class. 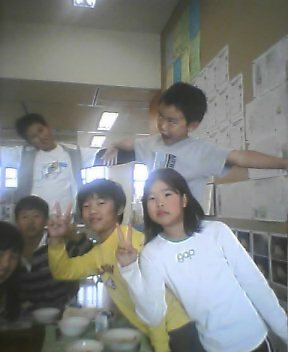 I was eating kyushoku with the kids at my elementary school, when they asked me why I spike my hair. I told them “God told me to”, and for some reason, the kid on the right stood up on a chair and acted out dying on the cross. “I’m Jesus Christ!” he said as the other kids laughed. It was so offensive, that I couldn’t contain my laughter. As I was laughing, the words “Blashpemer! You’re going straight to hell!” jumped into my head. Ah, I love teaching at elementary school. The incident reminds me of the story about the Japanese department store in Tokyo that displayed a smiling crucified Santa during Chrismas. Its disappointing when you can’t confirm a good story like this. It turns out that we are the first school in Osaka to have spotted the South-American red-backed black widow! Yay!